City workers took advantage of compensation rules, common among public employees in California, that made retirement deals even better. Key to this was boosting an employee’s eve-of-retirement wages, which form the basis of the pension calculations. He may be like you, but he also juggles better than you, and is wilder than you, more fun than you, cooler than you. He’s what a king of the nerds really looks like. Sure, he might grow a beard and put on a little potbelly, but he wouldn’t tuck in his t-shirt. He is not that kind of nerd. Instead, he’s got plugs in his ears and a shock of gloriously product-mussed hair and hipster glasses and he doesn’t own a long-sleeve dress shirt, in case you were wondering. A couple of nights after telling me the story about putting her hand in the boiling water, Ashlyn sat in the kitchen, playing with the headband that held back her long brown hair. We had all been drawing on napkins and playing checkers and listening to Ashlyn and Tristen sing “Call Me Maybe,” when all of a sudden Tara gasped and lifted the hair away from her daughter’s ears. She was bleeding beneath it. The headband had been cutting into her skin entire time we were sitting there. I had thought that people might come out to encourage them, and even warm them with offers of coffee, but rather the opposite occurred when some of the residents closed their shutters as if to wish the legionnaires gone. This fit a pattern I had seen all day, of drivers barely bothering to slow as they passed the line of exhausted troops. When I mentioned my surprise to Boulanger he said that the French love their army once a year, on Bastille Day, but only if the sky is blue. 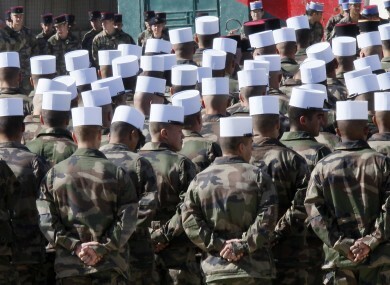 As for the foreigners of the Foreign Legion, by definition they have always been expendable. In 2010, Jeffrey Goldberg wrote in The New Yorker about the efforts of two American conservationists and the point at which right and wrong began to blur.